Our cardboard coffin gift boxes are classic "Toe Pincher" style. Coffin box comes in 2 pieces, box and lid. They are constructed from black, heavyweight cardboard. Made in USA. When adding coffin to your shopping cart, the base price is $4.95. The dropdown "Coffin Size" option adds additional $2 for 12" and $4 for 18". There is no additional charge for the 8". ORDER 25 OR MORE OF ONE SIZE AND GET $0.25 OFF EACH COFFIN!!! Additional discounts given to larger quantity orders. NOTE FOR LARGE QUANTITY ORDERS!!! Please email us in advance for large qty order shipping costs. Large quantity orders are usually shipped UPS and can not be shipped to a PO Box. The cost for large qty's using UPS is much less expensive than the websites estimated USPS shipping cost. An actual street address is required. 25 - 143 Save $0.25 ea. 144 - 999 Save 10% ea. 1000 - 1999 Save 15% ea. 2000 - 3999 Save 30% ea. 4000 - > Save 35% ea. Why display hat boxes when you can display coffin boxes! These are a lovely accent to any dark decor. Coffins comes in set of three. 8", 12", and 18". 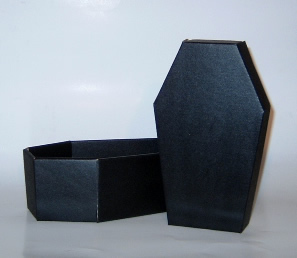 These durable black cardboard coffins are made in the USA.